The taste of sweet, rich pumpkin has haunted me the entire month of November while it was so inaccessible. I don’t really know why there is no pumpkin in Peru, but the more I thought about all the new recipes I couldn’t try and the old favorites I was missing, the more obsessed I became. So for our first meal after arriving home, we decided to try a new pumpkin recipe. I often use canned pumpkin, but we had purchased several sugar pumpkins for decoration before we left, with the intent of cooking them as well. We didn't get around to them before departure, but the weather was so cold while we were gone, they were still in fine shape on our return. Heat 1 Tbsp oil in large skillet over medium heat. 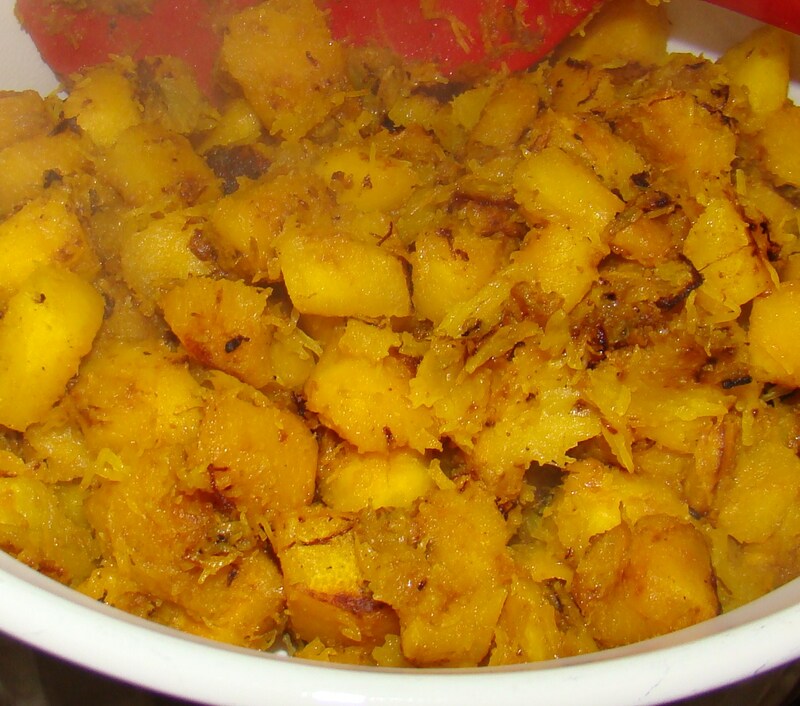 Cook pumpkin until golden, stirring occasionally, 8 – 10 minutes. Transfer to bowl. Add remaining 1 Tbsp oil to same skillet. 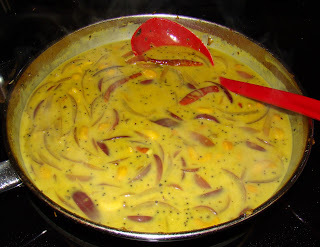 Add mustard seeds and basil (or curry leaves) and cook until seeds pop and leaves sizzle, about 30 seconds. Add onions, garlic and ginger. Saute until onions are golden, about 4 minutes. Add chiles, turmeric and cumin and stir-fry 1 minute. Add coconut milk and coconut cream. Increase heat to medium high. Boil until thickened, about 2 minutes. Return pumpkin to pan and reduce heat to medium. Simmer until pumpkin is heated through and tender, about 4 minutes. 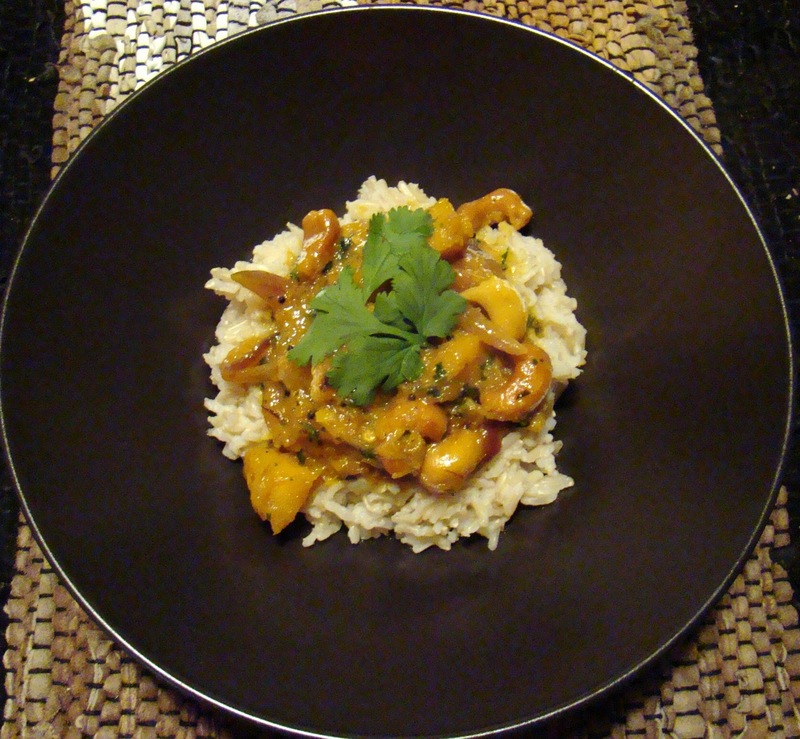 Stir in cilantro, lime juice and cashews. Salt to taste. Serve over rice and garnish with cilantro. I made brown basamati rice, which is not usually my favorite, but we ate so much white rice in Peru, I thought it would be healthier. It was a good choice because the stew was a little sweet and the heartier rice helped dilute the sweetness. The recipe didn’t say to chop up the chiles and stir them into the stew, but next time I will. The added heat would be a good contrast to the sweetness of the coconut. This was my first time to use coconut cream and it was really rich! I thought I wouldn't mind missing a traditional Thanksgiving, but we also cooked a turkey and bought a ready-made pumpkin pie to have a psuedo-turkey day dinner last night. This looks and sounds unlike anything I have ever cooked before! I'm glad you got your pumpkin! Can I ask a really silly question? When cubing the pumpkin do I take off the outer skin or just eat that up as well? I am NOT experienced cooking with pumpkin. I've had basmati rice once and I liked it. I gotta have this. You do take the skin off and cut out the inside, like you would with an acorn squash. I just ate sweet potato skin for the first time and it was fine, but I don't think pumpkin rind would be very good! Ok, Judy, that's not one that I'd have pulled out of the magazine to try but now that I see it, it looks really good!